Most people are familiar with shelf brackets. They hold the shelf up so you can put your things away on it. Balconies, bay windows, and other things that need to be held up also have brackets. These can be very plain and functional. They can also be very ornate and beautiful. If you want ornate and beautiful, think Stromberg GFRC. Stromberg GFRC has a huge number of stock bracket designs. These range from stark to elaborately ornate. 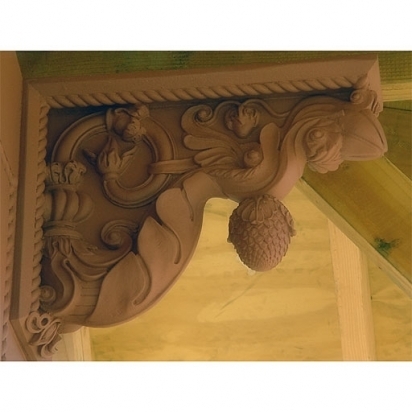 Although each bracket is capable of bearing a load, many are installed in a purely ornamental capacity. As with all Stromberg GFRC products, you receive more than a bracket when you work with us. We provide a catalog of bracket designs for you to choose from. If you do not find anything that suites your tastes, we will work with you to design a bracket to meet your needs. We will provide a CAD drawing for your plans for each design you order. Because these brackets are cast according to the CAD drawing, you can order a hundred of them and get 100 identical brackets. We will even install them for you if necessary. Stromberg GFRC is strong but lightweight. It holds detail well and can be used indoors or out. If you are ready to order your Stromberg GFRC brackets, please call us at (903) 454-0904 today or email us at info@strombergarchitectural.com.